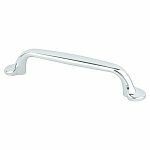 The polished chrome Valencia pull is an ideal option to enhance your kitchen cabinetry. Its sturdy, low clearance handle provides for years of effortless operation. Note: This product is also known as 7002126C, BQ7002126C on other websites.